CRAZY DISCOUNT! Was: $349.95 Now: $119.97! Eat your favorite fried foods made healthy with the Air Fryer. This multi-functional cooking apparatus does not need oil to cook you can Fry, Roast, Bake, BBQ, Grill, Broil and etc. The settings for time and temperature are easy and intuitive while, the fryer offers visibility allowing you to watch the entire process safely. The bowl is detachable allowing easy cleaning. This air fryer will take you to the future and revolutionize your cooking, allowing you to enjoy the food without the unwanted extras. The Air Fryer will take care of your cooking needs in just a few button pushes while you relax. Healthy Cooking: Fat & Oil free. User friendly digital control panel. Double safety settings, GS-A13 approved. Easy to set time & temp. , then air fryer does all. Visibility through the whole process from all sides. Turbo air & Food rotating ensures even cooking. 3D heating! 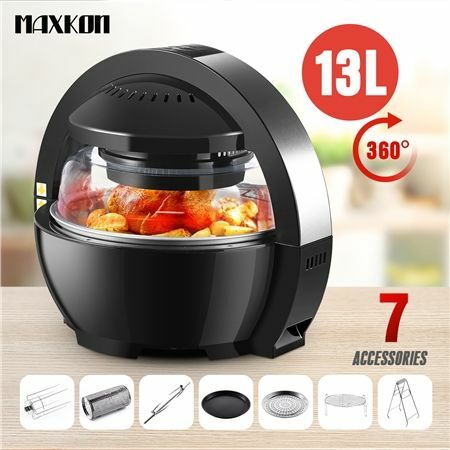 Multifunctional: Oil less fry, Roast, Bake, BBQ, Grill, Broil, etc. Perfect cooking: Foods become crispy outside, and juicy inside. Patented turbo air guidance from top to bottom. No need to preheat! Quick cooking: Fry chips in 15-20 minutes, Roast 2kgs chicken in 30 minutes. Is a great buy.. and wicked deal.. loads of extras..